If you're heading to Winter Village to check out our Christmas Tree and holiday decorations, be sure not to miss the festivities over on the other side of the park as well. Along the 5th Avenue Terrace of the New York Public Library, one can't help but stop and notice the imposing twin marble lions that garnish the terrace. Patience and Fortitude, as they're known, are decked out in seasonal wreaths inviting passersby into the library to catch a glimpse at the dazzling holiday display. 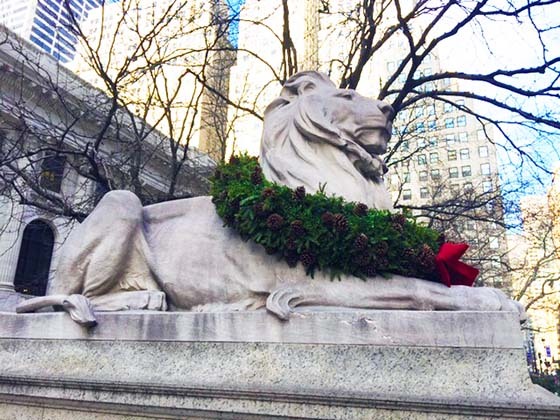 Fortitude, one of the library's famous marble lions, is adorned in a festive holiday wreath. The wreaths themselves are a New York City tradition, but the materials in past iterations had unfortunately started to wear down on the lions. The current wreaths, which debuted in 2013, weigh 150 pounds each and are made without any metal (which could corrode the lions) and with a water-proof plywood to avoid potential water damage. The stunning Christmas Tree is the highlight of Astor Hall. Inside the library, the focal point of the regularly ornate Astor Hall, is a massive tree, decked out in a tremendous variety of birds. 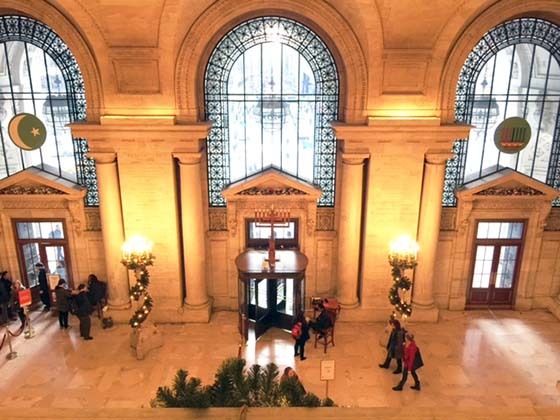 Carey Maloney, interior designer and NYPL Board of Trustees member, designed the tree display and was inspired by the library's huge collection of Christmas cards. Having found a mid-19th-century German card featuring a snow peaked fir tree adorned with birds as well as 1960's UNICEF cards prominently featuring birds, Carey knew the bird theme would be a unique way to weave this interesting collection of Library history into a spectacular display. The library is full of the smallest flourishes that really bring the place to life. Look out for the continued bird theme throughout. In addition to the display in Astor Hall, be sure to head up to the 3rd floor, where you can find a wealth of literary items from the Library’s Henry W. and Albert A. Berg Collection of English and American Literature, including Charles Dickens' copy of A Christmas Carol, complete with his handwritten notes. A 1929 Christmas card from James Joyce to a friend. A typed Christmas card from Jack Kerouac to his soon-to-be wife Stella, with a drawing. A “season’s greetings” card signed by Maurice Sendak to Randall and Mary Jarrell. Poetic Christmas greetings from Sean O’Casey and E. E. Cummings. Books with Christmas themes by T. S. Eliot and Edmund Wilson. The large glass windows of Astor Hall display a variety of Holiday symbols. The free display and holiday décor will be available to the public until Jan. 4. Be sure to stop by--you wont want to miss this! Thanks for spotlighting these! I'll be sure to go in and see them next time I'm in the area!